Chateau Fonbel has a long, ancient history that dates all the way back to the times when the ancient Romans were active in St. Emilion cultivating grapes for wine. However, the modern era for Chateau Fonbel starts in 1971, when Alain Vauthier purchased the estate. The Vauthier family are of course better known for owning the famous estate, Chateau Ausone, as well as Chateau Moulin St. Georges in Saint Emilion and the neighboring vineyard of Chateau La Clotte. The vineyard is located at the bottom of a slope on almost flat land, not too far from Chateau Ausone, Chateau Moulin St. Georges or the picturesque village of Saint Emilion. The property is still owned by the Vauthier family. Pauline Vauthier is firmly in charge of managing the property today. The 16 hectare Chateau Fonbel vineyard is planted to 70% Merlot, 20% Cabernet Sauvignon, 7% Petit Verdot and 3% Carmenere. This planting represents the largest percentage of Carmenere in the Right Bank. In fact, this is also one of the largest plantings of Carmenere in all of Bordeaux! Chateau Fonbel could have the highest portion of Petit Verdot in the Right Bank as 7% of their vineyard is planted to Petit Verdot. The vineyard has a terroir of clay, sand and gravel soils. The vines are on average, close to 25 years of age. The large amount of Carmenere and Petit Verdot in the vineyards provide a unique styling to Chateau Fonbel. The actual blend is often the same as what you find planted in the vineyard at Chateau Fonbel. 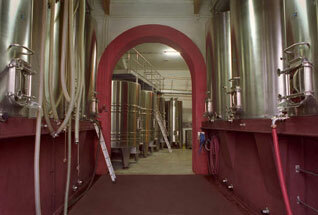 To produce the wine of Chateau Fonbel, the grapes are vinified in stainless steel, temperature controlled vats. Malolactic fermentation takes place in vat. Chateau Fonbel is aged in 30% new, French oak barrels for close to 10 months before bottling. The wine of Fonbel is produced by the same team that makes Chateau Ausone. The production is quite large, with close to 10,000 cases made here each vintage. The young, talented, Pauline Vauthier is slowly, but surely, taking a more active roll at Chateau Fonbel, Chateau Moulin Saint Georges and Chateau Ausone, while her father, Alain Vauthier continues to take a step back. On average, 8,000 cases of Chateau Fonbel wine are produced every year. Chateau Fonbel is better with at least 4-5 years of bottle age. Of course that can vary slightly, depending on the vintage. Chateau Fonbel is best enjoyed in the first 4-16 years of life. Young vintages can be decanted for about 1 hour or so. This allows the wine to soften and open its perfume. Older vintages might need very little decanting, just enough to remove the sediment. Chateau Fonbel is best served at 15.5 degrees Celsius, 60 degrees Fahrenheit. The cool, almost cellar temperature gives the wine more freshness and lift. Chateau Fonbel is best paired with all types of classic meat dishes, veal, pork, beef, lamb, duck, game, roast chicken, roasted, braised and grilled dishes. Chateau Fonbel is also good when matched with Asian dishes, rich fish courses like tuna, salmon, mushrooms and pasta. Chateau Fonbel is a really fine example of a Bordeaux value wine that combines character, quality and fair prices. Current vintages can be found on average for about $25. A nose of spice, licorice and black raspberries, the wine is medium bodied with a bright character to the fruit. The tannins are ripe, the fruit is fresh with a hint of chocolate and you really feel the addition of the Carmenere and Petit Verdot, which lends all the spicy qualities. Give this a few years to age. The wine was made from a blend of 70% Merlot, 16% Cabernet Sauvignon, 7% Carmenere and 7% Petit Verdot. The harvest began September 29, starting with the Merlot and finishing October 15 with the Carmenere. Blending 80% Merlot, 10% Cabernet Sauvignon, 5% Carmenere and 5% Petit Verdot, this medium bodied, forward wine shows soft, black cherry and spicy notes with the freshness coming in at the end. Easy going, easy to like, medium bodied, soft wine with ample black raspberry and earthy notes in its character. This is not a wine built for aging. I'd drink it in its first decade of life. Licorice, earth, spice and fresh plum aromatics make up the perfume. On the palate, the medium bodied wine is soft in texture, finishing with fresh, sweet, ripe, blackberry. This crowd pleasing style of St. Emilion should drink well young. Licorice, flowers, black and red plums, spice and minerality scents are easy to find. This medium/full bodied, round textured wine is already starting to drink well.